This Pacemaker Tri-Level Mobile Home remodel is a perfect example of using a vintage mobile home as a base for small living. 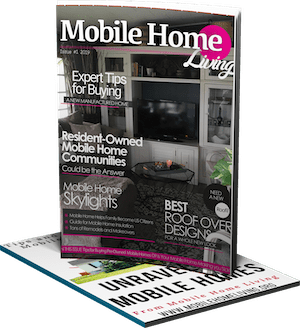 The condition of this 60-year-old home proves that American pride and workmanship was at its finest in the mid-1950’s when mobile homes were experiencing their Golden Age. 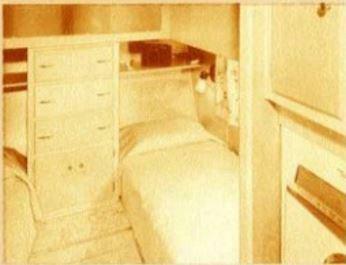 Pacemaker Corporation, once known as Pacemaker Trailer Company, is a well-known mobile home brand. Their headquarters was in the trailer capital of the world, Elkhart, Indiana. 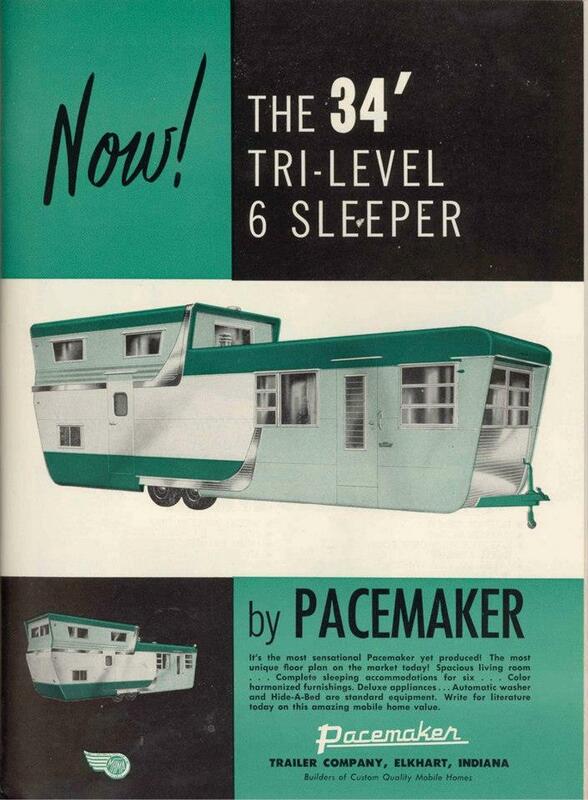 If you enjoy vintage mobile homes, you’ve likely heard of or seen advertisements for Pacemaker. 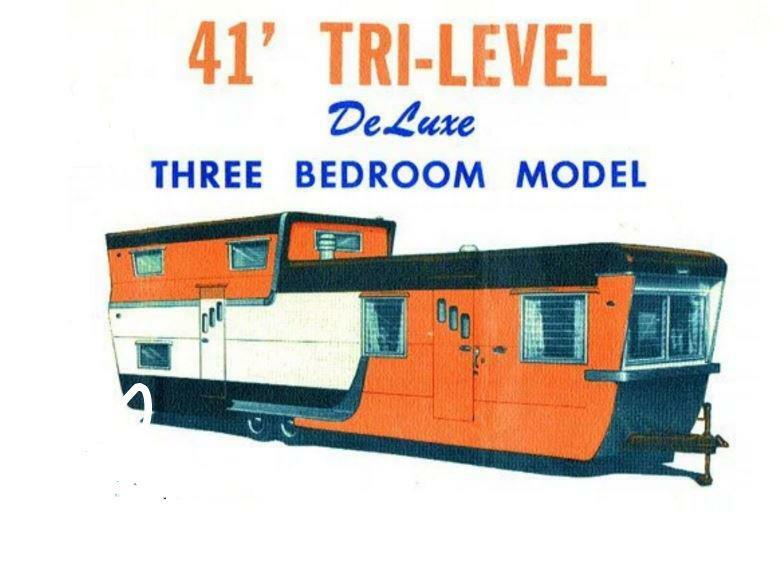 While their most well-known model may have been their Tri-Level mobile home, they also manufactured several single-story models. You can see several of Pacemaker’s earlier models at Atlas Mobile Home Museum. 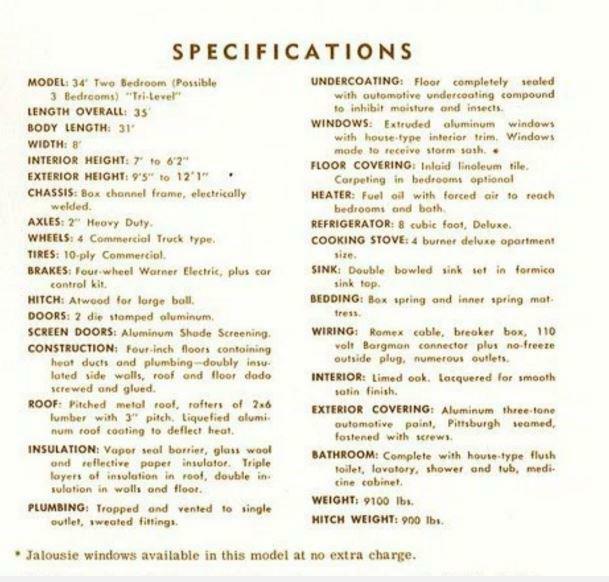 They even have a complete brochure for a 1949 Model 30 Tandem Delux. 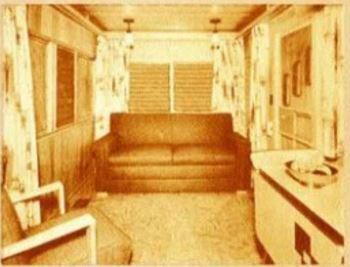 A full-page advertisement for the 34′ Pacemaker Tri-Level 6 Sleeper. 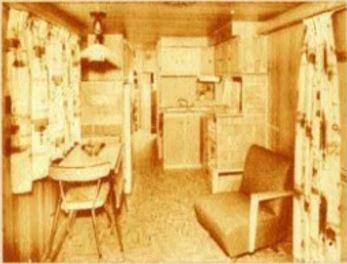 The Pacemaker Tri-Level Mobile Home’s were manufactured in the 1950’s with high-quality materials for the era. Windows: Extruded aluminum windows with house-type interior trim. Windows made to receive storm sash. Jalousie windows available in this model at no extra charge. Floor Covering: Inlaid linoleum tile. Carpeting in bedrooms optional. 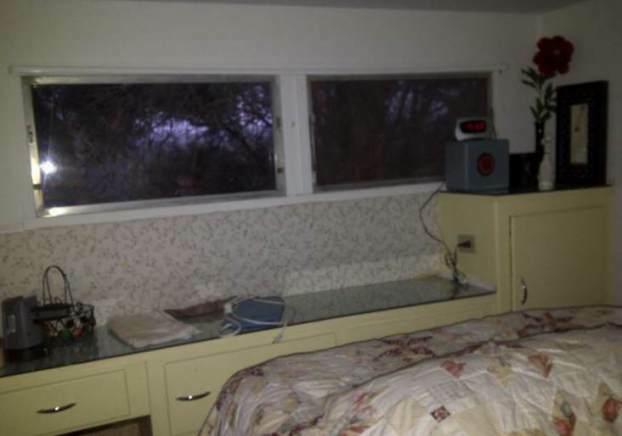 We can thank Reddit user, GoogleJuice, for sharing this lovely 1954 Pacemaker Tri-Level Mobile Home Remodel, in the subreddit, Tiny Houses. A page dedicated to living small. This Pacemaker Tri-Level mobile home is 8′ x 34′ with a second story of about 8′ x 8′ for a total of about 336 square foot of living space. 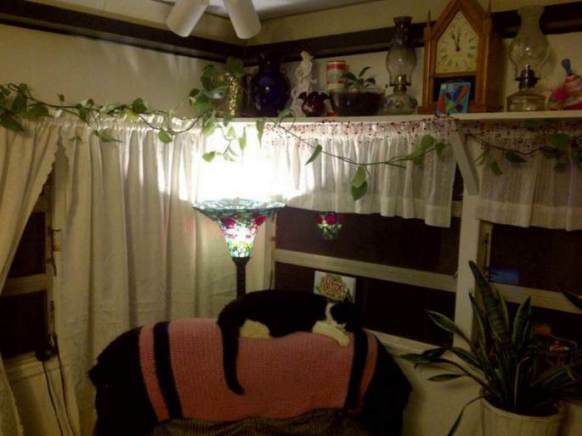 Ellie did a great job of remodeling her vintage mobile home! 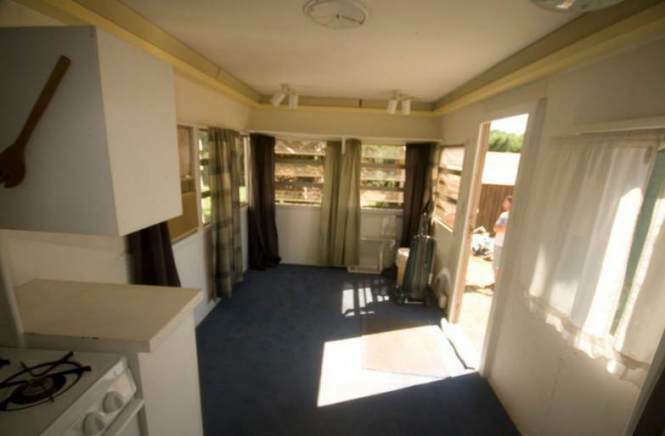 These images show the home’s condition when Ellie purchased it. The home was in fair condition to be more than half a century old! 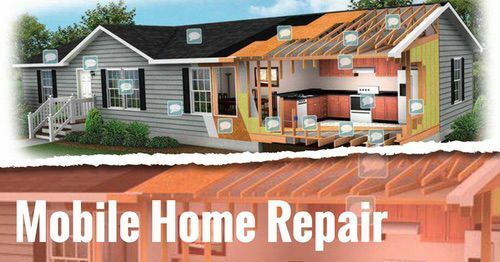 On the back bottom of the home, at end of the home with the tri-level bedroom, there was some damage that needed to be repaired. This area is susceptible to damage on campers and tow trailers due to tires throwing water. 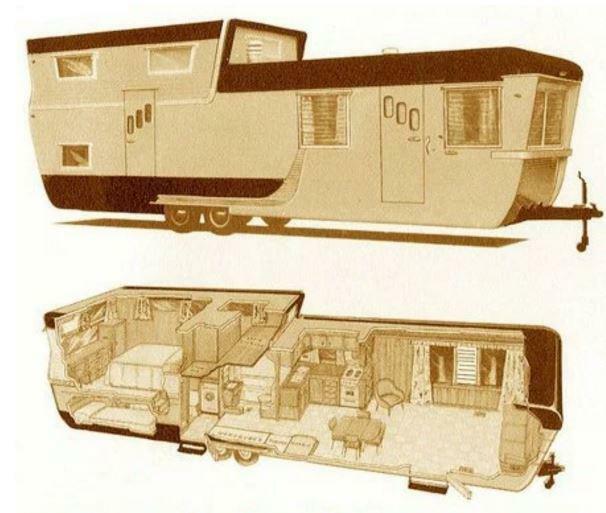 At 9000 pounds, this mobile home could be towed by a fairly standard, but powerful, vehicle of the 1950’s. Ellie replaced the damaged wood frame and added new aluminum siding. 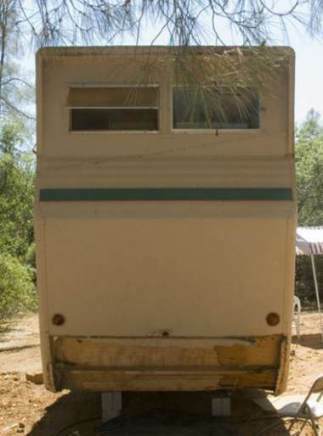 The Pacemaker Tri-Level Mobile Home during the exterior paint project. The home would have been coated in a metal primer before the paint was applied. 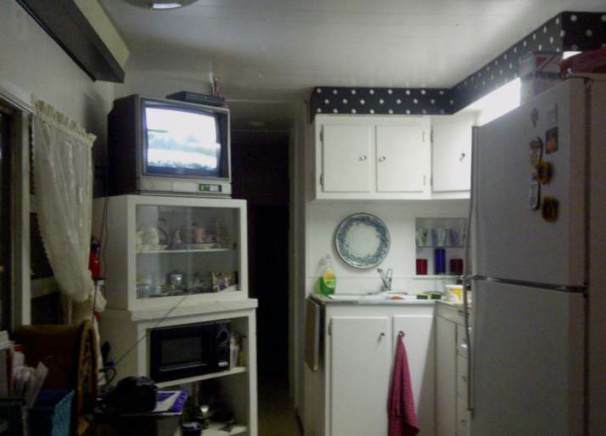 The living room and kitchen of the Tri-Level mobile home had been remodeled previously. The limed oak paneling had been painted or replaced. Brochure image of a newly built Tri-Level living room. The bedrooms have a very unique design. In the image below you can see a detailed, expanded view of a similar Pacemaker Tri-Level as represented by the builder in an advertisement. The 2 story section of the home holds the bedrooms, one on the top and one on the bottom. There are steps leading up to the top bedroom. The two small beds are separated by a built-in dresser. The bottom bedroom in a newly built Tri-Level. Below, you can see the steps that lead up to the master bedroom and the lower bedroom. 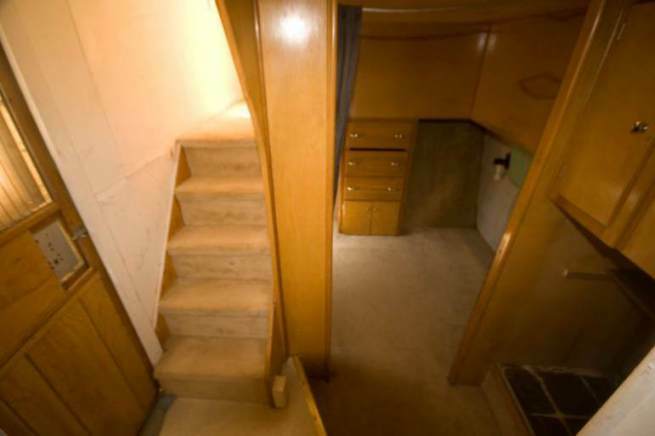 While the master bedroom is small for its size, the Tri-Level had more than enough built-in storage. 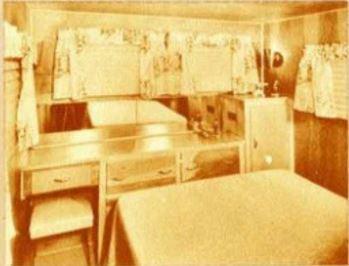 Closets and dresser were scattered throughout the home, especially in the bedrooms. Built-in dresser in master bedroom of Tri-level. 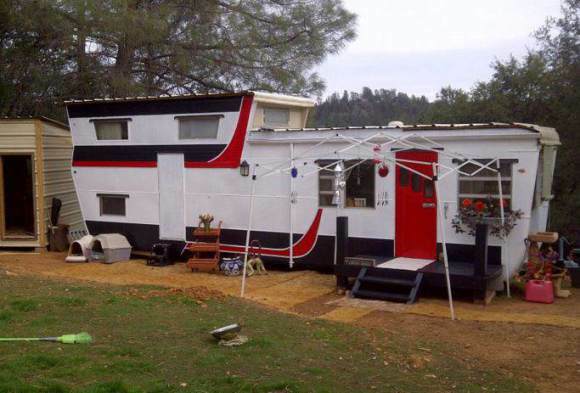 Ellie did a fine job on this 1954 Pacemaker Tri-level Mobile Home remodel. Here you can see the the furnished and decorated living room after the home was repaired and painted. It is a cozy place indeed! 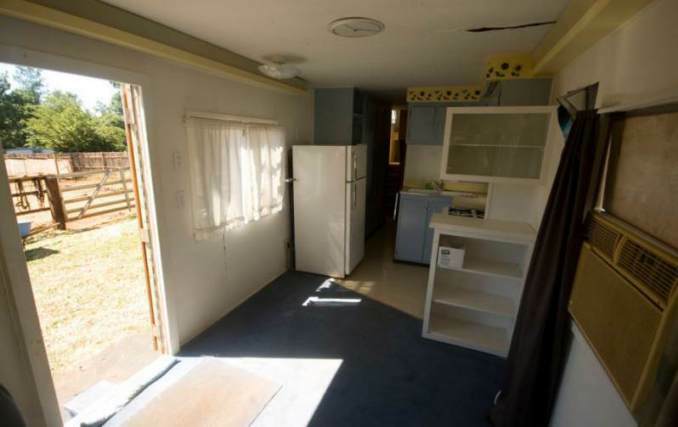 The kitchen is stylish and modern, especially to be in a mobile home that is 61 years old! 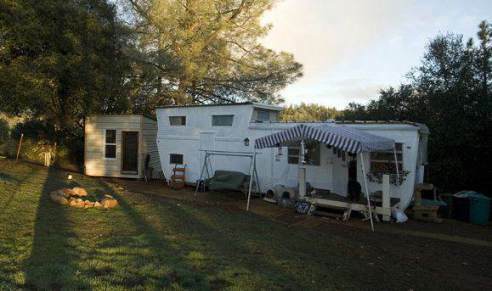 Vintage mobile homes are a great example of American ingenuity and workmanship. This trailer belonged to my grandparents. My grandfather once restored it in the 70’s. Then it sat on my parents property and we lived in it as a young married couple 34 years ago. Then, my mom donated it to Wolf Mountain Camp where we lived and served until 2008( but lived in a different abode). 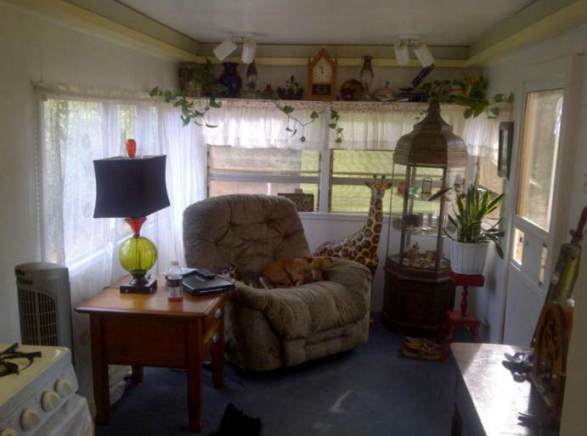 One of the best things about vintage mobile homes are the memories they conjure up for many of us. Seeing a mobile home model where many great memories were made is pure nostalgia! I LOVE LOVE LOVE living small!! My life is so much more simple. Easy to clean, easy to maintain, easy to afford. Letting go of the rat race and trying to keep up with the Jones has been an eye-opening pleasure!! I no longer struggle to make needs meet. I live on very little and spend very little. And walk right past all the expensive THINGS others think they need and keep my money in my pocket. 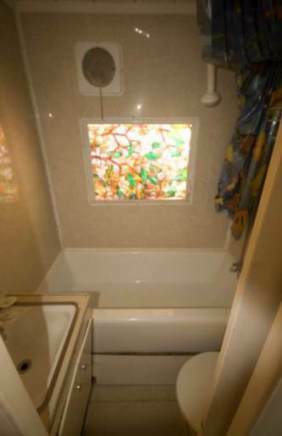 My bathroom is a little small but I love my 1954 two story trailer. I fixed it up and continue to fix it up. I did build a small 10×10 cabin for an office but it is now a guest room. No toilet yet though. But I want to remedy that soon I hope. 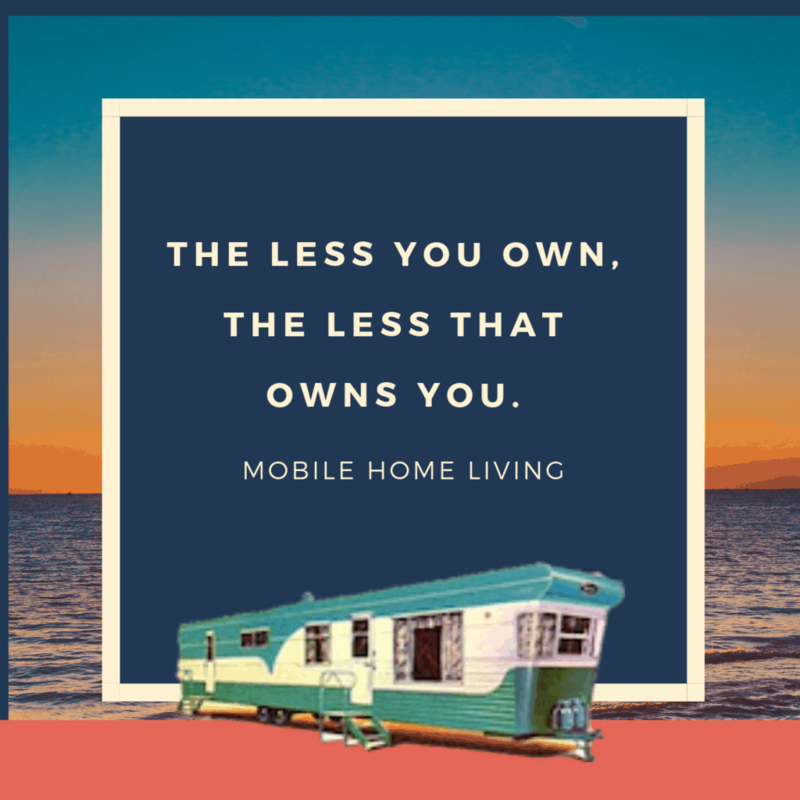 Buying a vintage mobile home and remodeling it is a perfect way to live a more affordable and simple life. 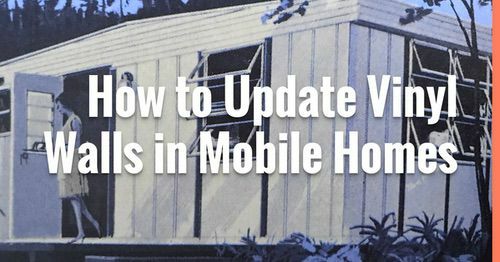 It’s usually not difficult to find an older mobile home that has good bones but needs a little updating and TLC. The idea has been tested time and again and the results are always amazing, just like this one. Hi there, I am the owner of this trailer, Ellie. Thanks so much for this wonderful article and for all the comments. I am sad to say that I am losing the land my trailer sits on due to unforeseen family circumstances. I was going to let the trailer be sold with the land but it looks like my family has something else in mind, so I am seriously thinking of selling my wonderful trailer that I love so much and letting someone take her off this land. Moving it here, the tow truck driver scraped the tail end and I had to repair it. I am not sure how road worthy it is, But I towed it in worse condition for over 150 miles. The tires would have to be put back on and it would take some work to get her out of here but I am willing to sell her to anyone interested in giving me a good price. I have been living in it for 8 years now and am still living in it today. Everything works fantastic. 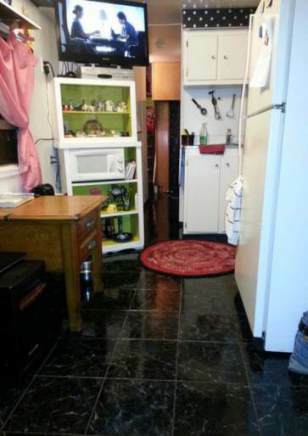 Even has a brand new frig and microwave. The wiring was upgraded before I bought it. You can see how much I have done to it. I am willing to take a respectable offer. If you are seriously interested lets talk about it. I was told by an air-stream restoration lady from Sonora, that my trailer as it sits is worth $45,000 but if properly restored to factory would be worth about $120,000. I do not know how true that is but I do think she is worth something and I am willing to take a proper offer. Thanks so much. I want her to go to someone that will take care of her and not let her rot. I want her to be with someone that loves my trailer as much as I do. It breaks my heart to have to give her up. She is in Amador County CA. in the Sierra foothills and looking for a loving home. Thank you!! 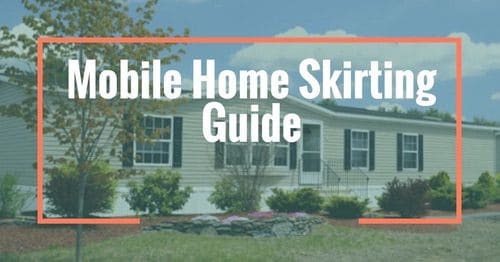 I live in a 1968 Town and Country Split Level mobile home – That my parents bought brand new in January 1968 – it has been home to me since the day we moved in (Saturday February 3, 1968). I might have left at times, but I always came home. Now that my parents are gone it is my full time home. I wouldn’t live in anything else. It has been moved several times over the years and is now in Phoenix, Arizona. I was hoping to move it to California someday – now that I am retired. I then could about say that my home is a true American Home since it would have crossed the country. We moved them in the old days, now they just sit. That is a wonderful story John. How very cool to be living in it all your life. My trailer here, was made to be taken to Alaska, but it never went and ended up somewhere near Nevada City, CA. and moved around there for a while. Now she is here in Jackson, CA and I have to sell her. Thank you for your reply. It is a shame you have to sell your home. Maybe some day some one will take it to Alaska. Crystal, in all your resources, do you know of any website for buying vintage trailer homes (for those wanted to refurbished and reuse? There are a lot of sites out there with vintage homes but they never seem to be up-to-date. I began inquring about a unit, only to learn it was posted two years ago and never updated. Then I learned the owner had finally just junked it. What a shame. And, a waste. I think the best resource for you will be Search Tempest. Search Tempest allows you to set alerts for keywords like Spartan Trailer, Airstream, vintage mobile home, vintage camper, etc either nationwide or within a certain area on both Ebay and Craigslist. You can get an email daily or weekly. Craigslist is the probably the most updated ad listing online so you won’t have to worry too much about outdated ads- they make it really easy for a seller to take the ad down once it’s sold. Problem was, you had to search for whatever you wanted in each area (WV only has 2 sections but I’ve seen some states have 20+ towns listed separately and you’d have to search each one. Search tempest solves that problem completely. It’s really easy to use! They also have a Search Tempest for automobiles. 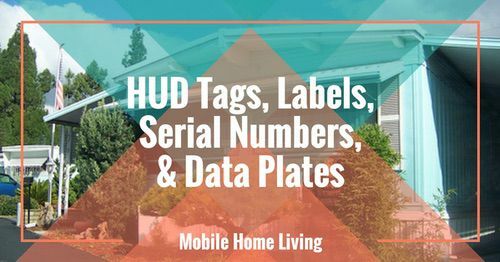 Just type in your keywords (vintage camper, vintage mobile home, etc.) and how far you’re willing to drive to buy and it will do the rest for you. I bought my vintage 1965 Airstream last year off of a local Facebook page/group called something like ‘Weekly Trader for Southern WV’ (there is a weekly printed newspaper where you call in your ad by phone, I think they just started a FB group). The owner listed it and I commented within 2 minutes. It was meant to be! Best of luck! I’m positive the right one will come along for you! I would love to see it! If you can please email photos to me at [email protected], thank you! 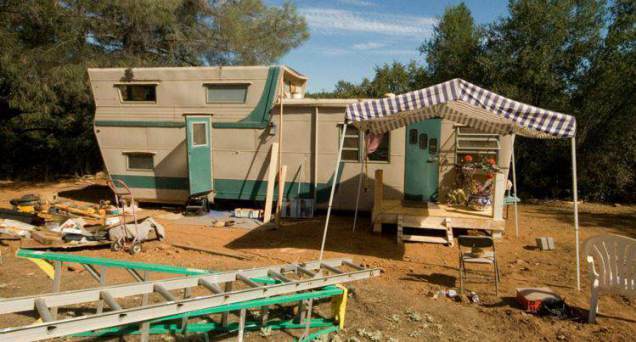 I will sell you this trailer Randy! Do you still have your home for sale?? Im looking for a 2 story to love and call home. What an interesting trailer. I’ve never seen one with a second story on it. The homeowner has done a great job of making it her own. Thank you Shirlee! It was a labor of love! I’ve always wanted to see actual pictures of the inside of these. Thanks. The cutaway was never enough to put it all in perspective. What a great unit ! I have really enjoyed your newsletter. 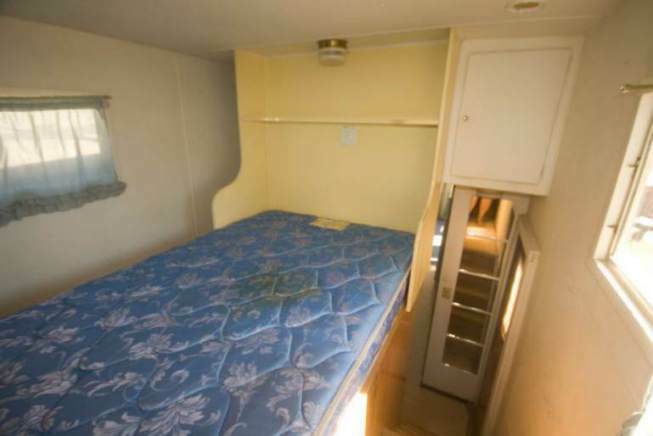 I moved from a 4 bedroom/2 bathroom., to a 2-2 small trailer. I have really enjoyed my new lifestyle. I also added a long porch with 6 post and it looks awesome. I have never lived in a mobile-home park. I also had other folks follow my porch upgrading they are not all as long as mine. I designed since I work in construction. I do have some remodeling I want to redo the cabinets. 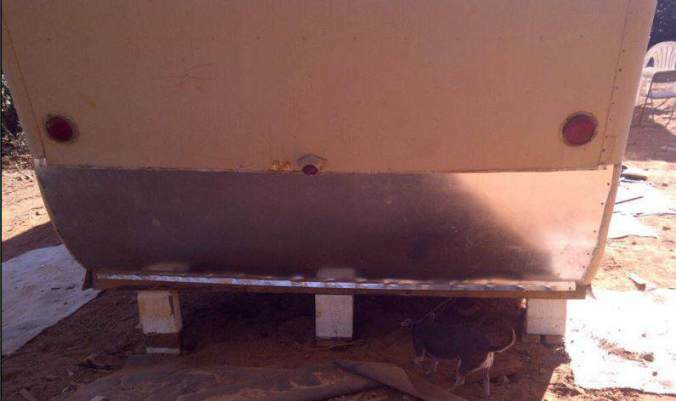 I just removed the garden tub that was just a dust collector. Anyway thanks for all the ideas. I will be retiring in about 15 years so my home will be paid for in 6 years. I also worked part-time at Hobby Lobby so I see lots of goodies. Space being limited. Any suggestions for hanging a flat screen on the wall. This is for Christmas present for my boys. Hi Linda! Great to hear from you! 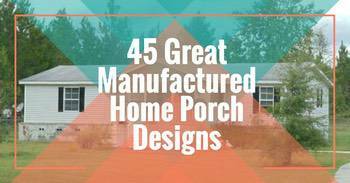 I would love to see that porch – it sounds exactly what I’m wanting to do to ours!